Proving that some people have no shame, Cycling in the South Bay’s Seth Davidson writes that some Palos Verdes Estates residents are attacking a 12-year old girl online. Because she had the audacity to speak up in front of the city council to support bicycle safety. Not unlike the truly offensive bikelash that rose up in the Silver Lake area when 11-year old Matlock Grossman dared to say he didn’t want to get run over when he rides his bike. We teach our kids that sometimes the right thing is the hard thing, but maybe we’ve lied to them a little bit: The right thing is always the hard thing. The right thing is the Gandhi thing, the MLK thing, the Lincoln thing. It’s the path everyone wants to take until they note it’s overgrown with weeds, and each blade of grass is the serrated edge of a knife. Whether or not you agree with them, kids should earn our respect just because they have the courage to get up there and say something. They deserve to be listened to simply because they have something to say. And if the haters of the world would just pause long enough to hear them, they might actually learn something. Bicycling says the US women’s pursuit team is poised to win gold in Rio. ESPN profiles Kristin Armstrong, who goes for her third straight Olympic gold in the time trial today, just one day shy of her 43rd birthday. This whole fourth place in Olympic road cycling events is getting old for Team USA. Mark Cavendish says he doesn’t believe Britain’s Lizzie Armistead doped, but she’s responsible for creating suspicion by missing three drug tests prior to the Olympic Games. Now that Robertson Blvd is no longer trendy, LA Magazine suggests four streets that could take its place, and considers the bike and transit options for each. West Hollywood officially unveils the first four stations for its new WeHo Pedals bikeshare. Which, if it follows the pattern of other bikeshare systems, will cost taxpayers little or nothing. CiclaValley considers the difference in attitudes towards bicycling between LA and Orange County. Or maybe just the difference between those who ride and those who don’t. The second Asian American bike tour rolls this Saturday through El Monte and the San Gabriel Valley. Just Ride LA is hosting a post-CicLAvia Happy Hour Shindig at the DTLA Plan Check this Sunday from 2 to 6 pm. If you’re missing a bike on the Central Coast, check with the Santa Rosa police, who recovered 16 hot bikes when they busted a bike thief; at least 34 other bikes had been stripped beyond recognition. A Hanford man was arrested on meth charges when police searched his backpack after stopping him for an undisclosed bicycle violation. City Lab says a collapsible paper bike helmet could revolutionize safety for bikeshare users. On the other hand, only one person has ever been killed while using bikeshare in the US, and she was already wearing a helmet. So just what problem are they trying to solve? A writer for Bicycling makes the case for ebikes after her mother falls in love with riding one. An ABC reporter rides his bike 500 miles between the Republican and Democratic conventions, talking to voters along the way. Not surprisingly, people are questioning the wisdom of having motor vehicles travel side-by-side with bicycling competitors in the Boulder CO Ironman, where a woman was killed in a collision with a truck when she reportedly veered into the traffic lane. El Paso TX approves a new bike plan that could eventually create a comprehensive network of bikeways resulting in up to 1,100 miles of bicycling infrastructure. It’s not always the driver who’s drunk; an Ohio cyclist is the victim of a solo crash after allegedly imbibing. And there’s the difference: Drunk bike riders pose the greatest danger to themselves, while drunk drivers pose a danger to everyone around them. Hoboken NJ police bust a 12-man bike theft ring. Caught on video: A New York bike rider captures the harrowing conditions of riding across the overly crowded Brooklyn Bridge on her bike cam — including a head-on crash with another cyclist. Evidently, pedestrians don’t like it much, either. We’re winning, comrades. Ebikes are outselling electric cars by seventy to one worldwide. A Calgary columnist says mounting evidence shows just how pointless extending bike helmet laws to adults really is. Meanwhile, a caller to a radio show calls the city’s separated bike lanes a moral outrage. No, seriously; protected bike lanes are as bad as, say, racism, or attacking a 12-year old girl online, or any other morally reprehensible thing you might come up with. Only 19 drivers have been charged under Ontario, Canada’s equivalent to the three-foot passing law. Which is 19 more than most places. Montreal will reopen a bridge after two years of reconstruction, with a shiny new bike path that disappears halfway across. The rich get richer. The Dutch city of Utrecht expands its traffic information network to direct cyclists to open bike parking spaces throughout the city. If you’re going to flee after trying to steal a bike, try not to leave your shoes behind. Don’t lead police on a six-mile bicycle chase across state lines on an Interstate highway — and fall down when they tase you, dammit. And, no, really. We should all feel sorry for those poor drivers who are forced to kill scofflaw cyclists through no fault of their own. Three years hardly seems long enough. According to the Daily Breeze, William Thomas Kelly reached a plea deal that will keep him behind bars for the next three years for his drunken road rage rampage through the Palos Verdes area, in which he deliberately used his car to assault a cyclist and smash into parked cars. Kelly reportedly hit one car, then backed up to hit it again and drove on to sideswipe a parked car. He then hit the pedal of a bicyclist; when the rider yelled at him, he backed up and used his car to knock the rider and his bike into the bushes, then drove back and forth over his bike. He was later found passed out with a BAC of at least 0.11 after crashing into a gated fence. Hopefully, the plea will include a condition that he never drive again. The LA Planning Commission voted Wednesday to approve the city’s mobility plan, including a slightly scaled back version of the 2010 bike plan and a commitment to Vision Zero. Streetsblog reports the planned Westwood Blvd bike lane survived an attack by a representative of Councilmember Paul Koretz, while Commissioner Richard Katz questioned whether bike facilities belong on the street at all. Not with thinking like that, anyway. CicLAvia offers a list of activities along Sunday’s Pasadena route, while KNBC-4, KCET and the Pasadena Star-News looks forward to it. Note to Star-News: Unless the director of Walden School is selling something as he rides to work, the word you want is pedals, not peddles. Feeder rides — and a walk — are available from throughout the area. The Militant Angeleno provides his must-read guide to the Rose City route; seriously, never go to any CicLAvia without reading the Militant’s detailed and insightful guides first. Time Out gives their thoughts on Sunday’s event, while CiclaValley provides a handful of tips and a handy checklist of everything you need to bring. And yes, bikes are optional; this should be the most walkable CicLAvia yet. In honor of CicLAvia, KPCC will broadcast a one-hour show all about bikes at 10 am today and again on Sunday; you can listen live online. And the San Gabriel Tribune says every weekend should be like CicLAvia in every downtown in the San Gabriel Valley and Whittier areas. Or maybe just everywhere. I’m not going to be able to make this one, so let us all know how it goes. 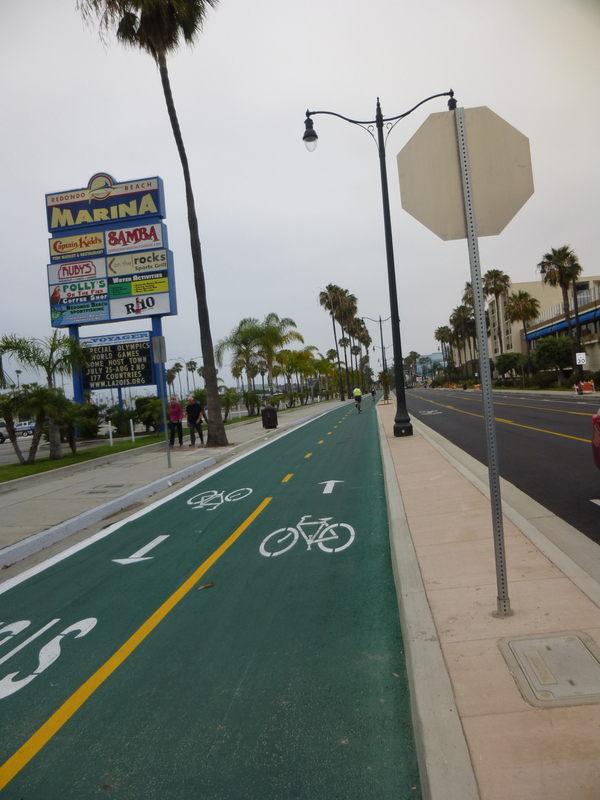 I’m hearing nothing but good things about the new green separated bike lanes in Redondo Beach, which includes some of the area’s first bicycle traffic signals. But the smartest thing they did was put sharrows on the roadway next to it for riders who want to go faster or avoid the bikeway crowds on busy weekends. Both Ted Faber and Jim Lyle sent photos. LGBT site Frontiers Media looks at the bike scene in the City of Angeles, with brief overview of bicycling in the city. They go on to list five places every LA bike enthusiast should know, along with seven gadgets and gizmos for geared-up Angelenos. Although I wouldn’t call a $3,750 Cervelo a gadget. And I sure as hell wouldn’t call it a mountain bike. The latest bike racing rumors involve mini-motors in the pro pelaton, as Ryder Hesjedal takes offense at having his bike checked to make sure he’s not motor doping. Former Giro champ Damiano Cunego is out of this years race with a broken collarbone, while Contador continues to hold the leader’s jersey. And no, he didn’t have a motor in his bike, either, but he did command some respect on Thursday. Meanwhile, former pro and ’97 TdF winner Jan Ulrich faces up to three years in prison for a DUI collision that injured two people. Closer to home, next year’s US pro cycling championship will move from Chattanooga to Winston-Salem NC. New bicycle maker Brilliant will ship you a steel frame bike for $300, as long as you’re willing to assemble it yourself. And don’t expect your LBS to fix it for you if you screw it up. Then again, it might be easier to just print your next ti bike, or at least the handlebars. Or maybe you’d prefer a steam powered bike. Streetsblog gives us part two of their interview with retiring UCLA parking maven Donald Shoup. 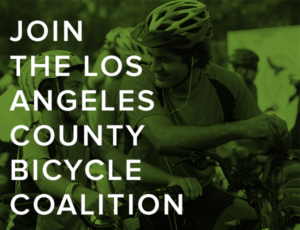 The LACBC interviews super bike volunteer Wayne “Ridetime” Howard, while Bicycling profiles Coolass Mike Bowers and his efforts to put 1,000 bikes in the hands of foster kids. Malibu city council committees approve the 850-page PCH Safety Study, which calls for 130 safety improvements along the dangerous coast highway, including bike lanes where they don’t conflict with street parking. God forbid a parking space should be sacrificed in the name of safety. The LA Weekly profiles an Oakland-based theater company that’s traveling across the country by bike; they’ll perform at the Santa Monica Pier on the 1st, before moving on the San Diego and eventually making their way to New York. A new proposal to replace the much-hated plans to complete the 710 Freeway includes light rail and a multi-lane boulevard complete with busways and a separated bike path. 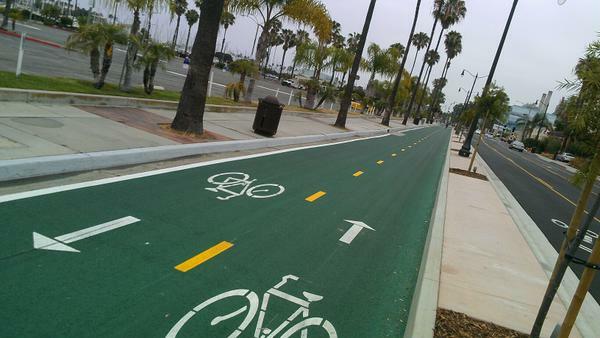 The first phase of Santa Monica’s MANGo neighborhood greenway officially opens today. Long Beach is officially opening the new pedestrian walkway on the beach today, which promises to improve safety on the beachfront bike path by separating bikes from people on foot. Something Santa Monica desperately needs to do. Your last chance to weigh in on the Glendale-Hyperion Bridge could come this Wednesday before the Public Works Committee; the full city council often doesn’t allow public comments before taking a vote, especially if someone is likely to disagree with their pre-determined decisions. A Tustin man is under arrest for breaking the window of a bike shop and stealing an adult-sized tricycle; he was in the process of stealing another bike a mile away when caught. San Diego held their rain-delayed Bike to Work Day Friday. San Diego’s North County is sprouting new sharrows; the story reports that sharrows on the Coast Highway in Solano Beach dropped average speeds by 10 mph without increasing congestion. Nice that they’re using us for rolling speed bumps, though. A Marine vet who lost his legs in Afghanistan will set off from San Diego Monday for a 65-day ride across the US on a hand-cranked ‘bent. A legal opinion concludes that the planned 50-mile multi-use path through the Coachella Valley qualifies for tax funds as a roadway because electric golf carts will be allowed to use it. A gang member is under arrest for stabbing a bike riding Redlands art student in the face. San Francisco’s bike share system is expanding from 700 to 7,000 bikes throughout the Bay Area. As if the internet isn’t killing enough of their business, now Bay Area bike messengers are being targeted by bike thieves. The new Marin bicycling museum opens to the public on Saturday, June 6th, with nearly 200 years of bike history, including the Mountain Bike Hall of Fame; a local group celebrates by calling for a crackdown on Marin off-road riders. Modesto is working to convert itself to model bike-friendly city for everyone on two wheels. A new infographic from People for Bikes shows many of the assumptions about women and bicycling are wrong, while Bicycling suggests 10 ways bike shops can be more welcoming to women. But the biggest barrier to greater diversity on bikes may be access to safer infrastructure. Four cities are racing to build the first working protected intersection in the US. And no, Los Angeles isn’t one of them. Portland parents launch a national PAC to force apologists for traffic violence out of office. About damn time. A local motorcycle club plans to throw volleyballs at speeding Spokane sheriff’s deputies to protest the death of a 15-year old bicycle rider, after investigators conclude their patrol car didn’t hit the teen’s bike. Note to Spokane County Sheriff’s Department: It’s not unusual for bike riders to go over the handlebars in a panic stop without anyone actually hitting them; that doesn’t mean the driver who forced the panic stop isn’t responsible. Proof bike riders aren’t always the good guys. Colorado state police are looking for a bicyclist who caused a motorcycle rider to wipeout near my hometown; a witness reports the rider veered in front of the motorbike and slowed down, causing the victim to lose control and be thrown from his bike, then just turned around and rode away without stopping to help. Jerk. To no one’s surprise, the fatal shooting of a Colorado cyclist has officially been linked to the random shooting of a driver on the nearby I-25. Albuquerque becomes the latest city to get bike share before LA; officials hope the program will help revitalize the downtown area. A Texas bike rider discovers a casket, presumably with the body still inside, along a bike path after the recent floods. Michigan traffic engineers take road diet to the extreme, proposing a street with a single lane shared by drivers traveling in both directions, and bike lanes on either side; drivers are supposed to safely merge into the bike lanes when they meet a car coming in the opposite direction. Anyone want to guess how that will work in real life? Nice story from Ohio, as a 5th Grader saved the rewards he got in school for good behavior to buy his younger brother a bike — even though he didn’t have one himself. When teachers and administrators found out, they took up a collection to buy him one, too. A Notre Dame dean and physics professor has ridden across the country every summer for the last five years to raise funds for rare disorders. While the rest of New York’s media was focused on a bike riding neurological researcher killed by a hit-and-run driver who was fleeing the police, the Post saved its front page for a scofflaw cyclist out for a ride with his son. Virginia’s Bicycle Bandit faces up to 100 years in prison for robbing a series of banks before pedaling — not peddling — to make his getaway. A Baton Rouge driver turns himself in five days after he fatally stuck a bike rider. Which presumably would have given him plenty of time to sober up. Bike Score ranks the least bike friendly cities in Canada. A new Canadian study show wide traffic lanes make for more dangerous streets. Five years after Vancouver merchants fought separated bike lanes, they’d now fight if anyone tried to remove them, according to the leader of a local business association. A cyclist from the UK will attempt to break the seven day record by riding over 1,800 miles in a single week. Yes, the UK’s new 20 mph speed limits can reduce injury collisions, but only if drivers actually observe them; a study shows the lower limit reduced speeds by just 1 mph in one city. The acting leader of the British Labour party calls for a ban on large trucks during peak traffic hours to protect bike riders. Meanwhile, rear- and side-facing cameras on those same trucks could save the lives of cyclists and pedestrians, if they’d actually use them. Somewhere between 50 to 100 bystanders teamed together to lift a double decker bus — yes, a bus — off a critically injured Brit unicycle rider. Scottish lawyers warn about the danger to cyclists crossing Edinburgh’s tram tracks; one firm alone claims to represent nearly 100 such cases. An Irish Paralympic cyclist is raising funds for a new leg in hopes of making the podium in Rio next year. A New Zealand cyclist is attempting to circumnavigate the country in just three months, riding over 6,000 miles to raise funds for an ambulance company. Sydney, Australia officials go the wrong way, making the city more dangerous for cyclists by reneging on a promise to replace a bike lane scheduled for removal. A Bangkok bike commuter says he’s tired of weak support for bicycling, as well as suggestions that bike riders belong on an off-road recreational path instead of commuting. Actor Matthew Modine got his start with a bike left behind when someone smashed his grownup lemonade stand. The battle between cars and bikes has been going on a long time; the first recorded collision between two vehicles was between a bike and a car back in 1896. And be sure to look up every now and then when you ride. Recently, I mentioned a moving piece from Zócalo Public Square in which Aurelio Jose Berrera wrote of getting up early a few days a week to ride out in search of homeless people huddled in the doorways and alleys of our city, his bike loaded down with donated food to hand out to those in need. His story reminded me of a saint whose heart was similarly filled with compassion for a homeless stranger. So I was surprised to open my laptop the other day, and discover an email from Berrera thanking me. According to his message, what I wrote, along with a handful of other stories about his efforts, helped inspire Petaluma-based Yuba Bicycles to donate a Mundo cargo bike to make his volunteer work a little easier. But there’s more than one hero here. Yuba deserves a round of thanks for caring enough to give a bike to help those so many of us don’t even seem to see. As does everyone who contributes to help Berrera help them. I’m not sure how big a role I really played in helping him get the new bike. But his email made my week. You can learn a lot on a bike. It was on a ride through tiny town of St. Martinville, Louisiana, on the edge of the massive Atchafalaya swamp, that I stumbled up a beautiful little church, one of the first built in the state. And first learned the story of St. Martin de Tours who, as an officer in the Roman army, used his sword to cut his own cloak in two so he could give half to a tattered beggar. That image has stuck with me ever since, gnawing on the back of my mind as I wonder whether I do enough for others in need. That’s why I was struck by this first person report from the Eastside’s Aurelio Jose Barrera, who gets up early a few times a week, loads up his bike with donated food, and rides out to feed those in need while the city is still sleeping. I don’t know if that makes him a saint. But in my book, it makes him a hero. I received the following report from an Orange County rider this morning, and thought it was worth sharing. On Friday night, going southbound on Bolsa Chica, I noticed a length of purple ribbon lying in the gutter. I thought: Is that the purple ribbon from Michael Bastien’s memorial? And on approach, I noticed that the bike was kind of awry. It also looked unchained, but without time to check it out, I was left wondering all weekend. On Sunday morning I investigated, and sure enough… the purple ribbon wrapped around the power pole was drooping and the purple flowers were atilt. I tied a bow as best I could and started tidying up. The flowers in the hollow saddle had been flung to the ground, so I replaced them. The reflector had fallen from its conspicuous perch next to the cross nailed into the pole, and I couldn’t affix it so I just angled it between a spoke & the seat stay so it would catch headlights. And then I just kind of stared. Because the busted lock and chain are just lying on the sidewalk. Dunno how long they’ve been there, or whether there’d been a theft attempt or what, but the ghost bike’s been unlocked & unmolested for at least the past three days. Meanwhile, still no action by the DA against Bastien’s killer. By now, you’ve probably figured out that I’m a big fan of Ride 2 Recovery, a program that uses bikes to help wounded vets recover and make it all the way back after their service overseas, physically and emotionally. On March 28th, you’ll have a chance to help out while enjoying some of the most scenic and challenging roads in Southern California when the first ever 103-mile Bear Claw Classic — aka Seven Canyon Climb — rolls through the Santa Monica Mountains. 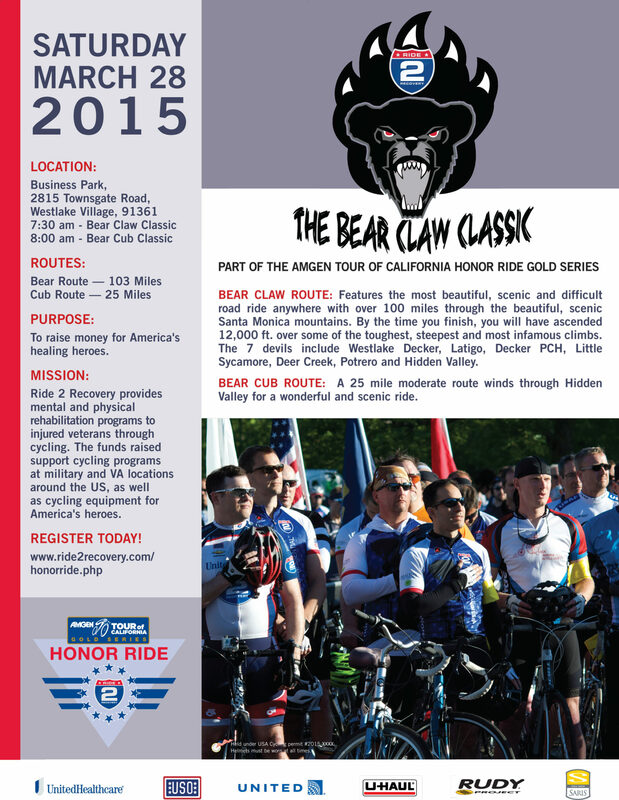 There will also be a 55-mile route, and a much easier 25-mile Honor Ride Los Angeles, or Cub Route, through Westlake Village and Thousand Oaks. Sounds like a good ride for a great cause. CiclaValley reports there will be two CicLAvia meetings in the San Fernando Valley tomorrow; motivated riders could make both. Getting around the Hollywood and Highland area will be a challenge for the next week as they gear up for Sunday’s Oscar celebration — even blocking LA’s one and only Bike Friendly Street. Speaking of which, will any of the many bike riding celebrities have the courage to ditch their limos and #biketheOscars? With all the street closures, they could have their own mini-CicLAvia. 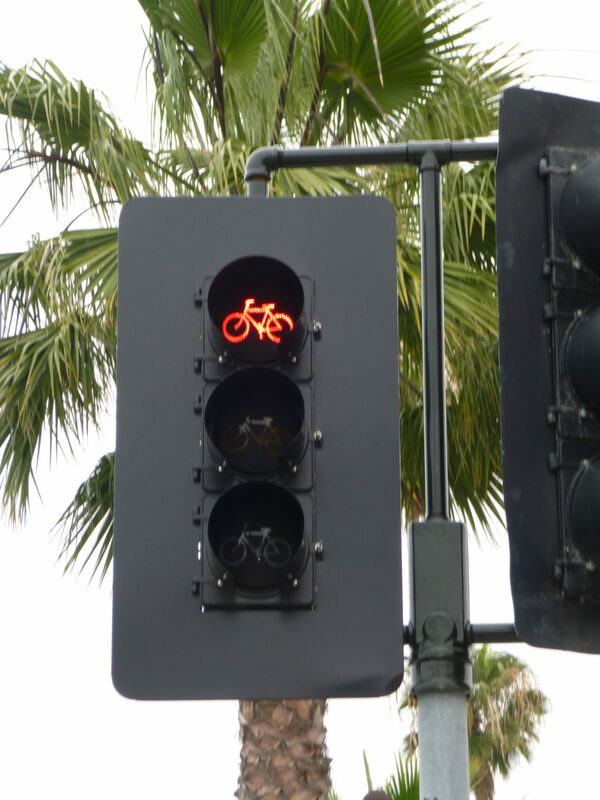 A San Diego cyclist is hospitalized after he was hit while allegedly running a red light; as always, the question is whether anyone other than the driver who hit him actually saw him go through it. San Francisco’s Vision Zero group maps out where you’re most likely to be hit by a car while walking or riding. Petaluma cyclists are split over the proposed law that would require all bike riders to wear a helmet; so are Sacramento area riders. Next City looks at what the last four presidents have done for bicycling, while the Atlantic points out Washington’s birthday used to be celebrated by bike. And Streetsblog offers photographic proof that most of the recent presidents rode, too. Lance is ordered to repay $10 million of the $12 million he received from a promotions company. Residents of a low-income Baton Rouge neighborhood will finally get sidewalks along a dangerous street, with a multi-use bikeway on one side. And yes, that street was pretty hair-raising when I lived down there a few decades back. The hit-and-run epidemic has hit Florida, doubling the number of incidents in Pensacola over the last three years. Nice. After a 12-year old Florida girl’s bike is badly damaged in a collision, sheriff’s deputies not only ticket the driver, one arranges to get the girl a new bike from Walmart. Now that’s more like it. A Brit teenager gets a year in jail for injuring a bike rider by throwing a bottle at him from a moving car. Note to US police: he only pled guilty after his DNA was found on the bottle, proving it is possible to actually investigate assaults against cyclists like you would any other hate crime. Alberto Contador plans to hang it up after the 2016 season; interesting that so many journalists conveniently forget he was stripped of one of his titles, just like Lloyd and Lance. In LA, you’re lucky if you can even find a bike rack; in Japan, cyclists get fully automated underground bike storage systems. Evidently, DC bike lanes are even a hit with street walkers. A London flashmob cheers on bike commuters as if they were in the Tour de France; not the first time we’ve seen something like that. And a new kind of steel promises stronger, lighter bike frames, replacing titanium for high-end bikes at a fraction of the cost. On a personal note, many thanks to C.S. Meszler. Your note made my day. In Spike Lee’s classic movie, they told him to do the right thing. But no one could seem to figure out just what that was. You see, when I got home from my ride today, I found an email waiting from yet another friend I’ve never met; a reader who’s been kind enough to steer my attention to a few things I might have missed otherwise. I don’t know the first thing about the LA Greensters, but, as vice-chair of the board, I am well familiar with St. Anne’s and the great things they do for the young women and their children in the Rampart district and beyond. If you could find space on your blog for a mention, it could help brighten a few more Christmas mornings. 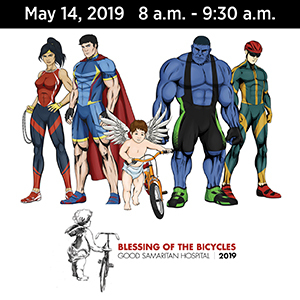 So I clicked on the attached link, and found myself reading about next month’s El Niño (para las niñas) Toy Ride, sponsored by LA Greensters — a group of cyclists committed to creating a more sustainable model for the film industry. And the more I read, the more I was moved — and the more I agreed that this is something you’d want to know about. You see, for over 100 years, St. Anne’s has helped local women, children and families in need, dealing with issues like teen pregnancy and parenting, physical, sexual and emotional abuse, and homelessness among adolescents. But recently, they got some bad news. The toys they were counting on for their annual Christmas Party wouldn’t be coming, after all. Which meant that 150 children wouldn’t get gifts this year. At least, that’s where things stood until the big-hearted people at LA Greensters found out about the situation and decided to do something about it. Everyone is encouraged to bring along an unwrapped toy or gift for children ages 0-17. We can arrange to pick up gifts and/or money donations before the ride if you cannot attend or wish to make a larger donation. If your toys are too big or too heavy for you to carry on the ride we are equipped to haul these items for you. All donations are fully tax deductible and a letter of acknowledgment will be sent to you from St. Anne’s a 501 (c)3 organization. I know this has been a hard year for all of us. Myself included. But I can’t think of anything that would make me more proud of this city’s cyclists than for a thousand cyclists to show up for the ride bearing so many gifts that the children of St. Anne’s can have a holiday they’ll remember for the rest of their lives. Maybe even enough that the sisters of St. Annes can pass them along to other organizations in need. And they’ll have the generosity of the cycling community to thank for it. Unfortunately, it doesn’t look like I’ll be able to join in. But I am going to stretch my budget to make room for a few toys I hadn’t planned buying on this year. So if the Greensters want to swing by and pick them up next week, just let me know when. For all your corporate types out there, this is a great opportunity for your company to make a donation that will really make a difference. Or if you’re outside the L.A. area and want to help, I’m sure they’ll take a check. For the rest of us, it only takes one small toy to put a smile on a child’s face. So do what you can. And pass this page, or the link to the LA Greenster’s Facebook page, along to everyone you know. Because this is a chance to open your heart and do the right thing. And for once, you don’t have to be Spike Lee to figure out what that is. 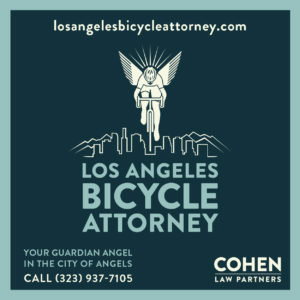 LACBC catches the new Chief’s ear, and gets a promise to address the problem of bike thefts, assaults and harassment against cyclists. Joe Linton does the math, and discovers that L.A.’s new bike plan calls for just 28 — yes, 28 — new miles of bike lanes; Dr. Alex says cyclist could have gotten more for our money if the plan had been created on a compost powered laptop. Flying Pigeon celebrates the Gold Line extension by offering a same-day discount to anyone who rides it. Acomprehensive regional transit plan for Los Angeles; too bad it’s 60 years old. Even though state law requires that bikes have equal access to every street, DWP still offers separate but unequal access to the annual Holiday Light Festival. 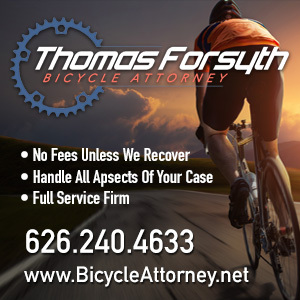 Writing on Bike Lawyer Bob Mionske’s blog, Rick Bernardi discusses police enforcement of a non-existent law against riding two-abreast in Redondo Beach. Cities for Cycling will attempt to improve road design standards to include cyclists and pedestrians. Shoot a cyclist with a gun, get 120 days in county lockup; shoot a car with a pellet gun, get over three years in state prison. The next time a driver complains that cyclists don’t pay our shareof road fees, show them this. Indianapolis forgives tickets for commuters who ride park trails before or after posted hours. In an interesting tactic, a Toronto cyclist takes the city before the labor relations board, claiming the streets aren’t safe for working commuters. The Department of DIY opens a branch in London’s East End. Finally, yesterday was a difficult day for cyclists; here in Westwood, at 9th and La Brea, and in the Windy — and rainy — City (love that headline, Dottie).